Pop quiz time! When does one make money from MTG finance? Today, the answer is none of the above. The only time you are literally making money from MTG is when you sell cards—preferably for profit. Options 1 through 4 above may set you up nicely to make money from Magic, but no profits are actually realized until you sell something for more than what you paid, after all expenses and fees are factored in. It’s why I like the phrase, “Nobody ever went bankrupt selling for a profit,” so much. It’s a reminder that you have to sell in order to make money. Otherwise, you may have the most beautiful, valuable, complete Magic collection in your sphere of influence. But you could also be cash poor and making no money. And, as morbid as it sounds, you can’t take any of these pieces are cardboard with you in the end. Your cards will be sold…eventually. I am constantly selling. My preferred method of outing cards is often to ship to ABUGames or Card Kingdom buylists, though occasionally you’ll see me throw up some deals on Twitter. Not long ago I posted a card for sale on Twitter and within a couple hours it was snatched up. The buyer proceeded to tell me how the card would likely continue its climb, eventually reaching a value more than 50% above where I had priced it. While this is nice information to have (I always like when others share their financial projections on cards), it is counter to my intent: to sell cards for profit. Do you think Star City Games or Card Kingdom cares that some Reserved List card is likely to rise in value over the next five years? Or that Mox Diamond has been on a steady climb recently? I’m sure they are aware, but I don’t think it figures directly into their business model. They aren’t in the business of buying up Mox Diamonds and Dual Lands to sit on for months or years. They are in the business of buying cards to have copies in stock so they can sell them for a profit to others. This is a proven, time-tested strategy that has worked for these vendors for many years. Their success inspires me to operate in much the same way. While I don’t have the time or resources to manage a full-blown buylist, lately I’ve been biased towards shopping around for deals that could then be converted into profits. Rather than speculate and hope that a card increases in price over some time horizon without guarantee, I’m enjoying this buy-and-sell approach. It’s my bias to take profits now and plow them into additional purchases rather than hold out for more. How Do I Find These Deals? Social Media Buying. Some people in the Magic community have local sources for their deals. They shop at their LGS’s, buy collections, or browse secretive websites I don’t know about for the best prices. Then they flip the cards quickly on social media—most commonly Twitter or Discord—to make a quick buck. They price these cards competitively, passing on some of the savings. When feasible, I’ll jump on these cards to try and squeeze out a tiny bit of margin. I may grab a Beta rare and ship it to ABUGames for store credit, which I can then use to acquire played Modern staples at okay pricing. Then I sell the Modern cards (which are quite hot right now) and grind out a modest margin. International Arbitrage. Yes, arbitrage is still a thing. Even though everyone already knows about it, it’s not always easy or straightforward to execute. This form of arbitrage entails buying cards from one country and selling them in another. Just this morning I made the purchase below from TokyoMTG over in Japan. I hope to flip some of these for modest profit; with recent price movement higher, these could prove to be even more profitable once the cards arrive. It’s not the most exciting of orders, but I flipped these low-end Unlimited rares to ABUGames for more than double what I paid in store credit. Granted an ABUGames buck is worth around $0.65-$0.70 in real money. But if I can acquire ABU bucksTM for $0.50 on the dollar and use credit to cash out at $0.70 on the dollar, the delta is a reasonable margin—especially when combining orders to save on shipping. But Sig, Why Not Hold the Reserved List Cards? It’s certainly reasonable to hold onto cards that are most likely to increase in value over time. This would include Reserved List playables such as Dual Lands or Grim Monolith, both of which see steady play in Legacy and Commander. You may also ask me why I would want to sell the Fetch Lands I’m acquiring from ABUGames with store credit. Surely, their prices will continue to climb as Modern Horizons approaches, right? There are three reasons I am selling these staples despite their proclivity to climb in price over the next few months. First, I like to maintain liquidity. This is the only way I can keep cash on hand to take advantage of the arbitrage deals I come across. Despite what some may assume, I normally operate with only a tiny pool of cash for my MTG finance transactions. The reason for this is simple, and driven by my long-term goal. Every time my cash level exceeds a certain, modest threshold, I take money out of my “Magic account” and transfer it into the college account. There it is used to purchase stocks to hold for 10-15 years, slowly accumulating dividends and profits to grow into a college nest egg. Remember, I have two tuitions to save for now! Second, I try to keep the vendor model in mind. I know that a vendor may not list all copies of a given card at once in case there’s a buyout, but for the most part stores want to sell their cards. That’s how they make money. Like I mentioned when I opened this article, I sell because I want to make money. Last but not least, I already do sit on a bunch of Reserved List cards. They’re in my decks! I also have a binder of cards I hold because I appreciate their artwork, flavor, and collectability. Other cards I acquire I either don’t really care much about or I already have copies of, so I see little reason to hold more. Some big-shot, vocal Magic finance people boast large collections of Dual Lands, Masterpieces, Arabian Nights cards, etc. That’s not my style—I have cards because I want to play them or collect them. Anything additional I pick up I intend to sell so they can re-enter circulation for someone else to enjoy. I’ve sold many cards lately that are on an upward trajectory. This includes Mana Crypt, Jace, the Mind Sculptor, Scalding Tarn, Mox Diamond, and Serra’s Sanctum. I even shipped Card Kingdom a played Revised Tundra when their buylist spiked to $245 for a day. I could have sat on these cards longer to grind out more profits. But that’s not my business model and it’s not my style. I thrive on liquidity, arbitrage, and selling for profits to put into college savings. Others have their own motivations and I applaud them to sticking to their strategies. But when you see me selling a hot card, don’t assume I’m being reckless and selling prematurely. In reality, I just operate on a different wavelength because my motivation may be different. Hopefully the explanation of my strategy in this article helps explain my behaviors. I don’t like to speculate, I don’t like to sit on excess copies of a card, and I don’t like to hold a card for months at a time unless it’s something I enjoy owning and want to keep. This is a strategy that has worked well for me as I continue to move money into the college savings account, and I will continue to apply it for years to come. Since I’ve been grinding ABUGames store credit so much lately, I thought I’d share some favorable buy prices there this week. Let’s start with Unlimited Two-Headed Giant of Foriys. I purchased six MP copies from TCGplayer a little while back for around $35 each. In played condition, ABU games pays $80 in store credit per copy, more than twice the cash price! For some reason Beta Kudzu is rather expensive! I don’t even know if the card sees any play in Old School. Yet ABUGames pays $166.25 in store credit for played copies. They pay $209 for slightly played copies! 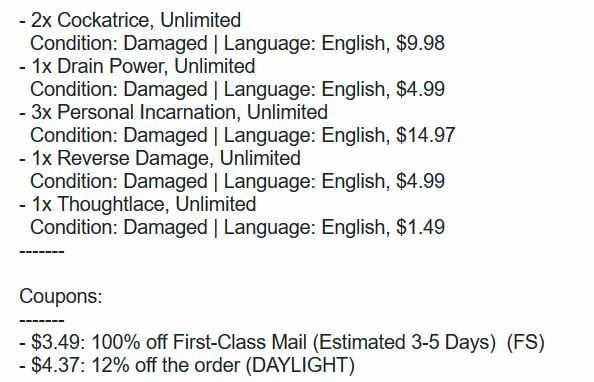 As of Sunday morning there was an LP copy listed on TCGplayer for $119.49 plus shipping. Once again, this is nearly the equivalent to paying $0.50 for an ABU buck in store credit, convertible to cash at roughly 65%. See how this adds up? I also flipped a couple copies of Beta Juggernaut for store credit. Though not recently, I had been able to acquire a couple played copies in the $50 range. ABUGames offers $128.65 in store credit for played copies and $96 for HP copies. Yet another example of doubling into store credit through domestic arbitrage. While I think you sometimes sell too quickly for too small a margin I appreciate that you stick with your strategy and make it work for you. You know my tactic is different. It’s important that everyone sticks to the strategies they’re comfortable with. I know your strategy well and it has worked out extremely well for you. But one difference in our tactics is that you seem to put more “new” money to work in Magic. I grow my collection more slowly and with more transactions, but I don’t have to put incremental dollars into the hobby because I generate enough income through selling. And writing ;-). THIS. It’s never a bad time to take profit off the table. Often people kick the sleeve for “getting out too early” but that line of thinking is flawed. I don’t view these cards as investments; they’ve no productive capacity. Trading them like currency makes sense. If you want to buy reserve list stuff to sit on I’d recommend a vanguard index mutual fund.